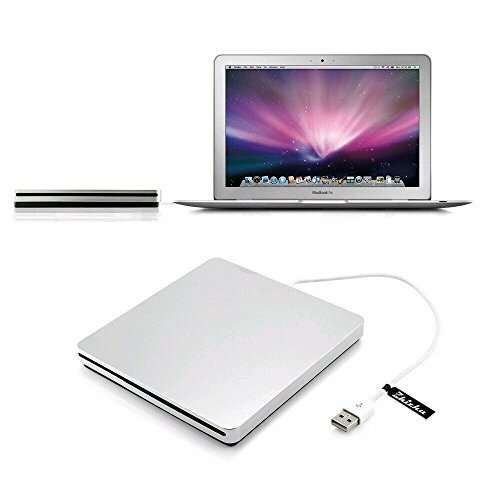 This slim USB external CD Drive DVD Player CD Burner is specially designed for the apple Macbook, Macbook Pro, Macbook Air or other PC/ Laptop with USB port, but without the Drive Hardware. With this USB DVD superdrive, it is easy for you to play CD/DVD movies and burn CD(only burn CD). It is powered by the USB and no driver, no external power supply is needed. Support plug and play. Auto-suction design and no eject button. This external disc dvd player is simple to use. With an emergency touch control on the upper right corner, it will be much easier for you to eject the disk. This USB external CD drive can read CD/DVD, and burner CD. Writing speed:24XCD-R; Reading speed: 24XCD-ROM; 8XDVD-ROM. 1.Please hook up the external cd drive to the direct USB port on your computer. If you connect it to a USB hub or extension cords, it maybe cannot recognize the external CD drive or read the CD/DVD. 2.When you connect the CD USB DVD drive to the desktops, please connect it with the computer's motherboard to avoid of power shortage. If you have any questions about this product by Zhizhu, contact us by completing and submitting the form below. If you are looking for a specif part number, please include it with your message.